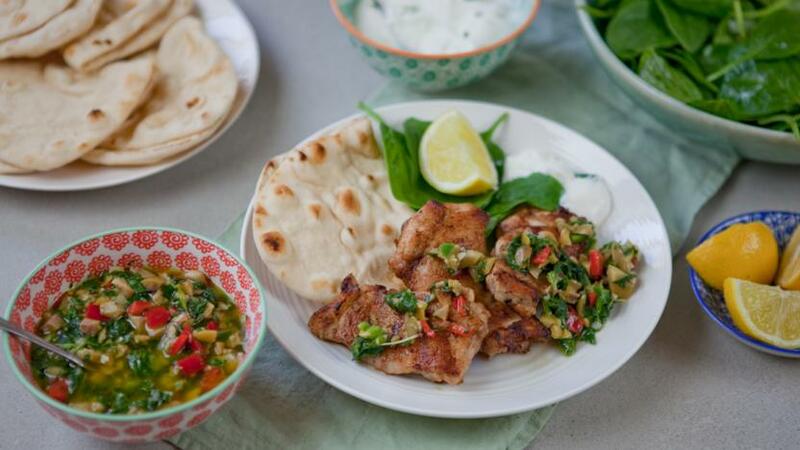 Spice up your chicken with a zingy Turkish marinade. 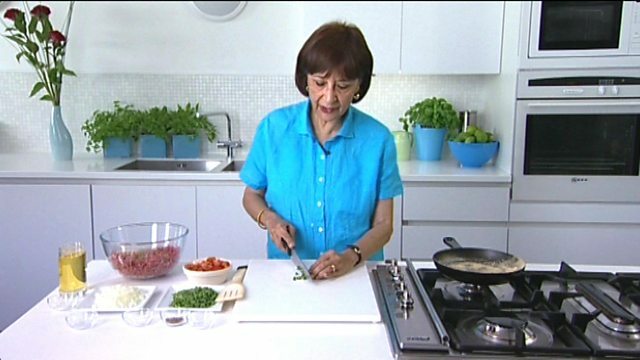 Make your own flatbreads and whip up a hot green relish for a real taste of the Middle East. For the chicken, make a marinade by mixing the olive oil, cinnamon, cayenne, cumin, garlic, salt and pepper together in a mixing bowl. Make little slits all over the undersides of the chicken with the point of a knife. Put the chicken in the marinade, turning to coat. Cover with cling film and put in the fridge. Leave in the fridge for a couple of hours, or overnight. Making sure to bring it to room temperature before cooking. To make the relish, put the garlic and sea salt in a pestle and mortar and bash it until it is crushed. Add the chillies, coriander, mint and olives and bash everything together. Gradually add the extra virgin olive oil and balsamic vinegar until you have a rough paste (it should be chunky, not puréed). Add lemon juice to taste and set aside. To make the flatbreads, put the flour in a medium bowl, add the salt and stir. Add enough water until the flour mix comes to a dough. Knead until smooth and divide into 4 pieces. Roll each piece into a circle and put on a hot griddle pan one at a time. Turn the bread over once charred marks have appeared and brush with the melted ghee. For the green salad, put the cucumber and leaves in a large bowl. Pour the olive oil and white wine vinegar in a small bowl and whisk in the mustard. Just before serving pour the dressing over the salad and mix. To cook the chicken, heat a griddle pan. Remove the chicken from the marinade, shaking off the excess. Cook the chicken over a medium heat, for about 2 minutes on each side. Reduce the heat to low and cook for another 4 minutes, or until cooked through. Put the chicken on a plate and serve with the flatbreads, chutney, green salad, lemon wedges and a bowl of Greek yoghurt.